From an outsiders perspective, it was hard to understand if the Vancouver Canucks were trying to tank in 2016-17 or not. Head coach Willie Desjardins was released of his duties on April 10, finishing this past season on a nine-game losing streak and missing the playoffs for a second-straight year. For what it’s worth, the Canucks ownership and management is stuck between a rock and a hard place. Three years ago the Canucks fans wanted a youth movement. They got one, but unfortunately the young players are making an impact at too slow of a rate. Injuries have set them back, too, and the aging Swedish twins – Henrick and Daniel Sedin – that refuse to wave their no trade clause have also hurt Vancouver’s chemistry. When everything fits together, it seems that the Canucks’ youth movement is working, but the reality is there is going to be growing pains. General Manager Jim Benning is building something but no one knows quite what he has up his sleeve. The Canucks now have the second best odds of landing the No. 1 overall pick and having the option to draft Nolan Patrick out of Winnipeg. Right now, Vancouver has too many pieces that they are not sure that fit yet. Banning built Vancouver in the way that if all goes well they might have gotten in the playoffs. The double-edged sword is however, if things didn’t pan out how they wanted, things were going to head south fast. Vancouver conceded the first goal in 53 out of their 82 games this season, which relates to a small part of the problem. Over the past several seasons, the Canucks have been forced to basically start their rebuild from next to nothing. 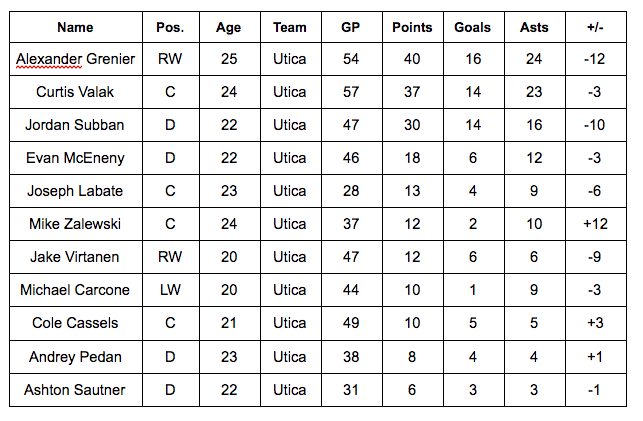 For a clearer glimpse, here is Vancouver’s s current prospect list. As the lists will indicate, the Canucks have piled up an astonishing number of players that might be a fit in its system within a year or two. The one common knock about the Canucks in years past however has been its development of young stars. Most of the time, they have been too afraid to immerse their players in the NHL, or in other terms, make their prospects learn from mistakes early on and progress once their careers move forward. This case implies heavily to 20 year-old RW Jake Virtanen, who next year could seek out a great dose of minutes on Vancouver’s fourth and third lines. In its entirety, it was a frustrating season in Vancouver. For whatever reason though, Canucks fans should feel that there is light at the end of the tunnel. There were glimpses of success in 2016-17, such as 22 year-old center Bo Harvat leading the team in points, and Brandon Sutter’s consistency on face-offs. Both of these can be building blocks to the future, as Vancouver’s painful rebuild takes on a new entity.